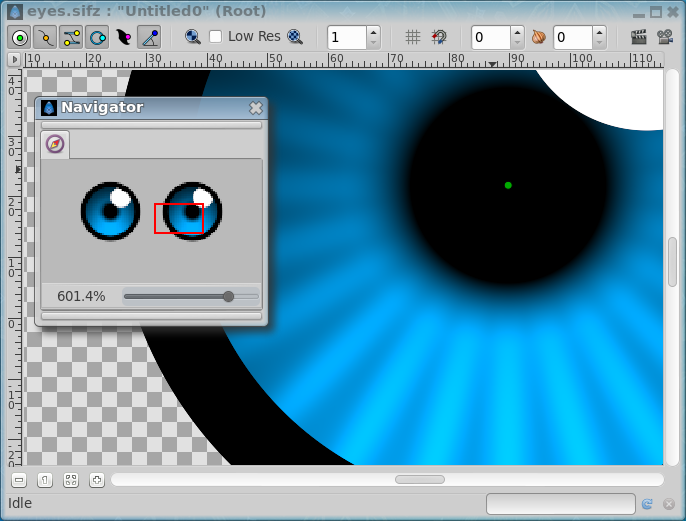 The Navigator dialog allows the user to position the zoomed working view quickly to the desired area. The navigator dialog shows you a thumbnail view of the currently selected canvas with a red rectangle indicating which part of the canvas is currently displayed in the editing window. You can zoom in and out by dragging the zoom slider at the bottom. Also the zoomed area can be panned by dragging the red rectangle around. Mouse wheel pans up and down. ⇧ Shift + mouse wheel pans left and right. Ctrl + mouse wheel zooms in and out. Zoom in limit is 1600% and out limit is 6.2%. It is possible to zoom in with Ctrl + mouse wheel beyond 1600% but can cause Synfig Studio to hang or crash in some situations. This page was last modified on 3 July 2015, at 09:09.